Excavation shoring – engineered structural support for temporary or permanent excavation – is used to facilitate construction of underground structures such as parking garages, subway stations, tower and bridge foundations, shafts, and structures on slopes. Excavations are shored to protect the people who enter them, to protect adjacent structures and utilities, to decrease excavation volumes, and to improve surface site access. Much of this work is done in close cooperation with specialist contractors and involves the development and improvement of construction methods and design details. Isherwood uses our experience and insight to interpret the factual soil information and make comparisons between alternative systems. Soldier pile & lagging shoring with one row of tiebacks. The most common shoring system for urban construction is the soldier pile and lagging system. Soldier piles – steel beams standing vertically like soldiers – are typically inserted into auger-drilled holes and cast in place using concrete. Below the base of the excavation, the ‘pile toe’ works with the soil to resist overturning at the base of the piles. Soldier piles define the perimeter of the excavation. Lagging, generally 3” x 8” timbers, is a facing material that spans between the piles. Excavation and lagging are carried out in stages starting at the top of the excavation. Caisson wall with tieback anchors at Smart House in Toronto, Ontario. Caisson (or secant) walls consist of drilled holes filled with concrete that form continuous arrays of interlocking shafts, periodically reinforced with vertical steel piles. For a cost premium over soldier pile and lagging, these walls (through their installation techniques and greater stiffness) provide better protection for structures near excavations. For this reason, caisson walls are generally used to support excavations adjacent to existing structures or utilities sensitive to ground movements. By extending these walls to greater depths, cofferdams can be created to retain water or saturated soils. 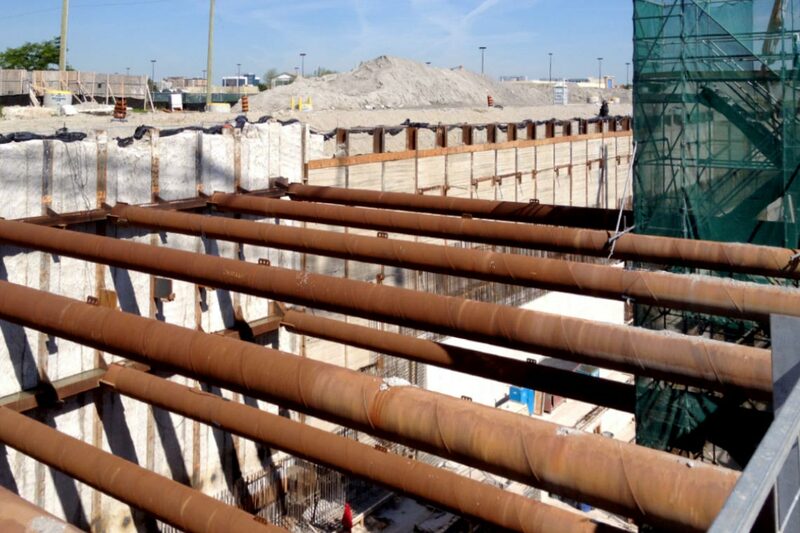 Caisson wall shoring system with cross-site HSS struts at every second pile. Excavation shoring walls, except soil nailed walls or cantilever systems, require lateral restraints. Most types of restraints can be preloaded to provide better movement control. Walls are typically supported with tiebacks, deadman anchors, rakers, or struts. Tiebacks and deadman anchors are tension elements which provide anchorage against the lateral earth pressures on the walls. They consist of steel bars or cables, which are connected to the shoring wall and extend into the ground beyond. Struts and rakers are typically steel compression members, which act inside the site. Struts span horizontally between the walls of the excavation to resist the imposed lateral loads. Rakers extend down from the shoring wall at an angle, and are braced against footings. Sheetpile shoring wall with two rows of tieback supports. 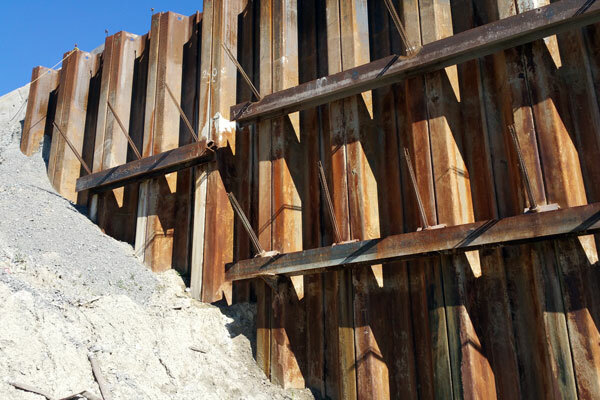 Sheet piles are manufactured by rolling steel into long corrugated structural sections with vertical interlocking joints on each side and are used to retain soil and/or water. Sheets come in a variety of shapes; the greater the amplitude of the ridges and the thickness of the steel, the greater the strength. The sheets are driven into the ground using vibratory or drop hammers. Each section of sheet is connected to the adjacent ones at the interlocking joints. Primary uses include retaining soft soils above or below the water table, in open water, in cofferdams, or waterfront retaining walls. 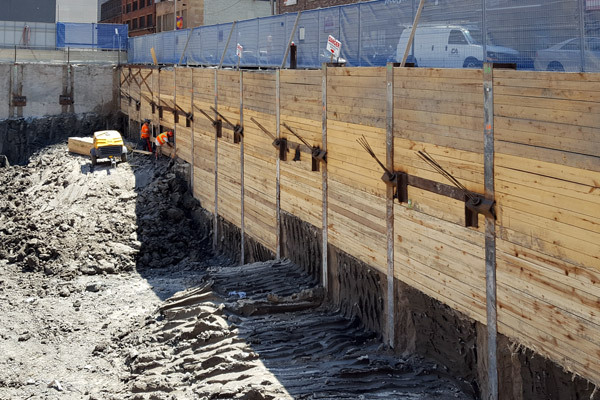 Tied-back shotcrete shoring wall on Keele Street in Toronto, Ontario. Shotcrete shoring consists of a reinforced or anchored soil mass with a shotcreted concrete lagging face, which provide lateral support and stabilize the earth during excavation. 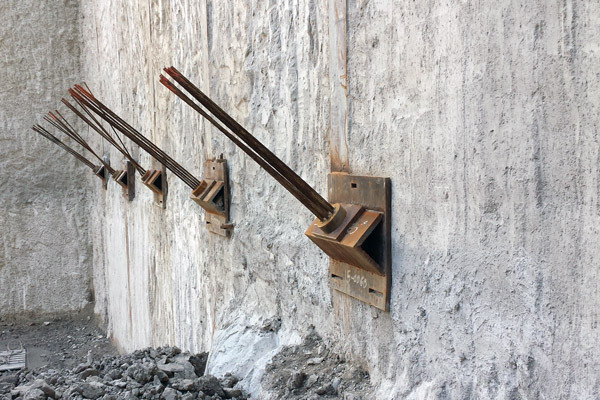 Vertical dowels are sometimes used to provide temporary face support during excavation where site conditions prevent panels from standing open long enough for shotcrete installation. 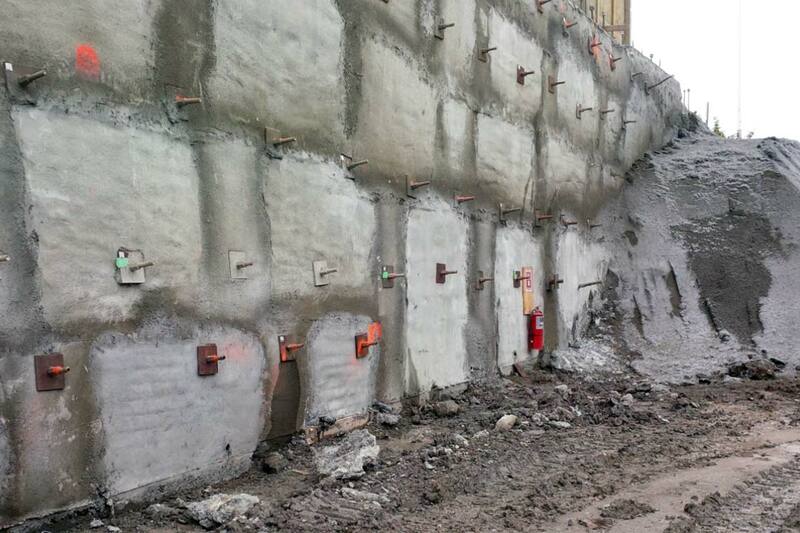 Shotcrete walls are approximately 20 percent of the thickness of conventional shoring walls and offer numerous cost savings due to lower material costs, and economies related to the use of light, compact, and versatile construction equipment.